Achilles pain is a common complaint, especially amongst runners. In competetive runners the lifetime incidence of achilles pain may be as high as 40-50%. The incidence of achilles rupture in the general population is about 7%, and in runners 8.3%. 80% of ruptures occur in recreational sport. Tendinosis is generally caused by an increase in loading beyond the tendons ability to cope and adapt. This can occur from a sudden change in intensity, frequency or duration of running, a change in footwear, change in running surface (soft), an increase in plyometric/ ballistic loading, very commonly from poor running style or after a period of relative deloading (inactivity, rest or sedentary lifestyle). Tendinopathy (in general), is more common in post menopausal women, type 2 diabetics, rheumatoid arthritis and obesity. People taking fluoroquinolone antibiotics may also develop an acute tendinopathy (so speak to your doctor if this occurs). 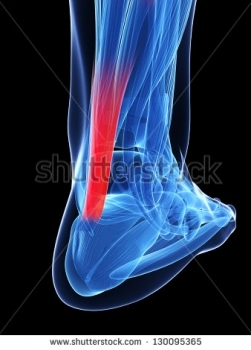 Achilles tendinosis needs to be differentiated from other causes of heel or achilles pain, including, bursitis, apophysitis, paratendinitis,posterior impingement syndrome, plantaris or flexor hallucis longus tendinosis, calcaneal stress fracture, referred pain, accessory soleus, posterior compartment sydrome or achilles pain caused by inflammatory diseases. So to get you running painfree again and guide you through the right steps, give us a call and make an appointment.